Vast Public Indifference: Happy SepmYbre! My grandmother was a Pepperell Woods, and I believe little Tryphena is my first cousin five times removed. That looks like a very early William Park stone, from the period when his style was all over the place and he hadn't yet learned to carve good letters. 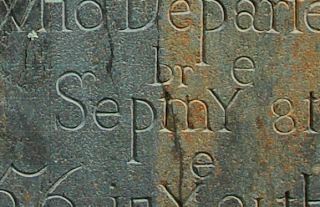 It's interesting that he emigrated from Scotland as a mature adult and experienced stonemason, but letter-carving per se must not have been one of his early specialties (although he quickly mastered it). I do wonder though if his stones as opposed to his sons' stones are attibuted correctly. That bears tangentially on your "depated" stones. If William Park came to New England as an adult from Scotland, would one expect him to drop his r's? The 1778 Fisk stone in your next post is from the Park workshop, but which member of the family carved it I don't know. Nope, I've got my Tryphenas mixed up. This one is my 6th great aunt (by marriage), her husband Isaac being my 6th great uncle. This Tryphena was the first of Isaac's three wives, and by his third wife Mary he had a daughter also named Tryphena. 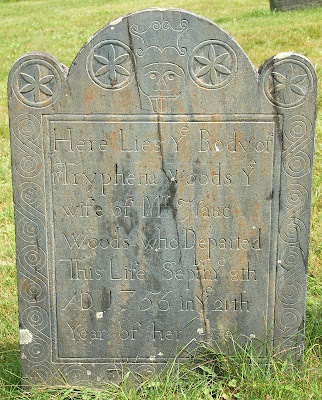 According to the Pepperell vital records, this Tryphena died of an unspecified fever. Pete has a great-great-great-great grandmother named Tryphena (b. 1800) who had a sister named Tryphosa. I was a little surprised to find a Tryphena born before 1750. Even though Tryphena and Tryphosa are mentioned in the Bible (Romans 16:12), it's such a classical name that I would have expected it to crop up after 1780 or so.